Provision of affordable, adequate and accessible housing is one of the major challenges facing India today, as it surges forward economically and demographically. Current government statistics put the housing shortfall at 10 million units, down from an estimated 19 million in 2011, but still staggeringly large. Almost 100 million people live in informal housing across the subcontinent. At the World Urban Forum this year, the government of India launched an effort to encourage new solutions to this daunting challenge. 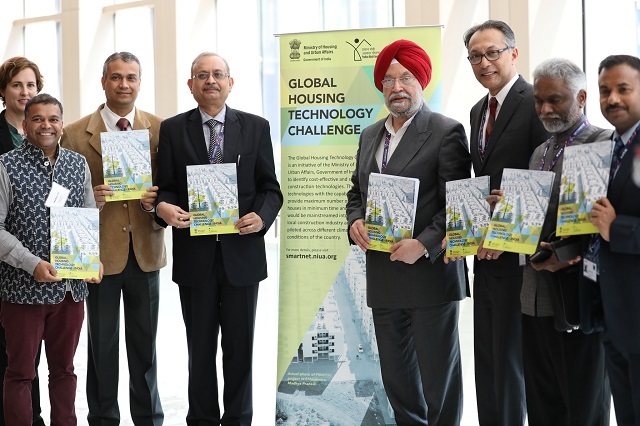 The Global Housing Technology Challenge – India, announced by Hardeep Singh Puri, union minister of state with independent charge in the Ministry of Housing and Urban Affairs, aims to encourage building technology entrepreneurs to apply their creative minds to the goal of providing every Indian family affordable and quality housing by 2022. The governments hopes the challenge will encourage better, faster, more efficient housing solutions to meet the needs of new urban residents and current residents living in substandard conditions. “The Global Housing Technology Challenge initiative essentially provides an opportunity, a canvas, under which leaders of green technologies, those in the business of construction, no matter where they may be placed, have an opportunity to come and participate in this bold Indian experiment,” Puri said. The Ministry of Housing and Urban Affairs will be accepting proposals from prospective participants, which they expect to range from construction companies and developers to research organizations and housing boards. Winning proposals will gain an opportunity to certify their technology in India and receive start-up funding in addition to mentoring from leading institutions. While technology is important to scale up and achieve speedy results, it’s important to consider lessons learned from previous efforts to address housing crises. A recent entry in the “World Resource Report: Towards a More Equal City” proposes three recommendations from experiences around the world. One is to allow upgrading and improvement of existing informal housing, with the involvement of the residents, rather than displacement to make way for new development. Another, is to reconsider land use and convert under-utilized areas of urban cores into affordable housing, rather than building new housing stock in the periphery isolated from jobs, services and social networks. And the third is to reevaluate rental options, expanding them to residents of lower income brackets, rather than focusing on policies that prioritize home ownership. As India seeks cutting edge innovations to meets its ambitious plan to provide housing for all, the world will be watching. Under business as usual, the affordable housing gap globally could increase dramatically in the years ahead, resulting in 1.6 billion people without proper housing worldwide by 2025. Valeria Gelman is a Communications Specialist & Program Coordinator II at WRI Ross Center for Sustainable Cities.